Visions of Jesus Christ.com - Myrrh weeping Icons Warren, Ohio. January 22, 2012 From [htocaap.org]. She weeps and who will come to see Her? She weeps and who will come to see Her? When we encounter a man, woman, or child with streams of tears flowing along their sweet youthful cheeks or catching in their lovely laugh lines we wonder if the person is burdened by sadness or sharing tears of joy. It’s hard to ignore the call of tears—right? God has created us to have compassion for each other making it a very natural gesture to draw near to each other in hope to receive comfort from the snares of this world or to gladly share in the glories of God. I humbly and lowly share with you She is! 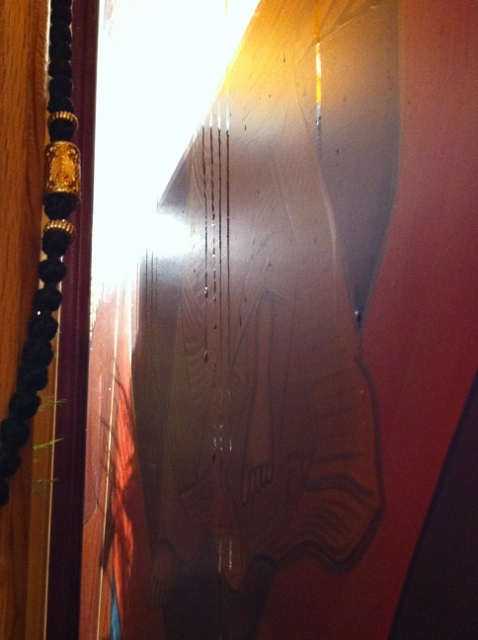 Two Theotokos icons are bearing holy Myrrh at St. Nicholas Orthodox Church here in Warren, Ohio. Yes, it’s very true and very real. In October 2011 the Theotokos icon on the iconostas started bearing holy Myrrh, about 15 streams were noted.I’ll never forget the sun’s rays catching what seemed to be every molecule in the Miro, making its only job to brilliantly glisten in an exceptional way to announce the Theotokos’ presence. A hello was whispered without a voice and my soul seemed to leap for joy with excitement! In July of 2010 and in October 2011 beads of Miro clustered on a small Theotokos icon which sits directly in front of the larger weeping icon and still continues to bead holy Myrrh as I write. Why? Why? Why is this happening at St. Nicholas Orthodox Church? Some say She is devastated by the state of our world and how each one of us, by our constant sinning, crucifies Her Son, our Lord, over and over as brutally as the first time which causes her to lament unceasingly! Some say She is sternly warning us to get our priorities straight, like any loving mother should, before it is too late. Is She drawing us near to say that we will certainly feel the consequence of all actions good and bad? Maybe She has bestowed a blessing on us. Could She be healing the sick, trying to bring others to Orthodoxy, or is She trying to unite our Orthodox churches for the love of Christ. These are only a few judgments chipping away at the tip of an iceberg of questions. The Very Reverend Protopresbyter Father Kenneth, the priest at St. Nicholas Church, addresses each inquiry with a very clear answer, [paraphrasing] ‘This gift will be very specific to each individual who humbles themselves to come to Her.’ This is a perfect fit answer. Each will benefit from Her in his/her own way. 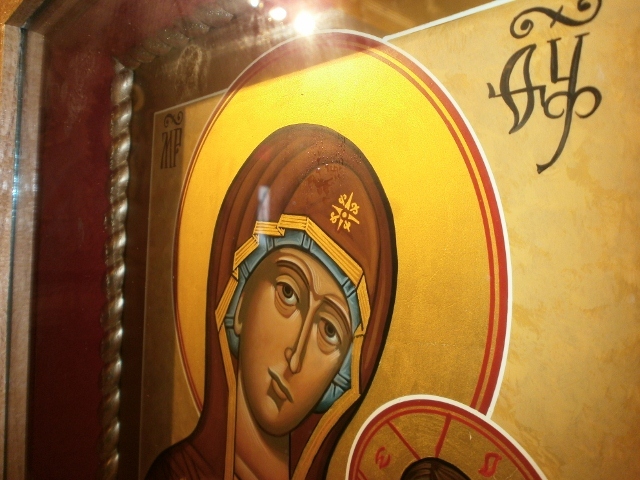 Is it ok to be curious about a weeping icon? Yes, of course but it is better to have faith! Faith is the key that opens the door to eternal life; though having a tangible miracle, such as the weeping icon, happen before my eyes was literally breathe taking! The awe of Her struck me to my knees in the lowest bow possible during Divine Liturgy. Faith and this miracle should make all of us sell everything we have and follow Christ! I don’t make light of our daily miracles. We are all blessed everyday with God’s works! Every Liturgy and on Feast days we partake of the Eucharist which is a miracle too. So many wonders gifted to us and what do we do with them? Are we going to choose to see the miracles and live in a Christ like manner or simply walk away justified by our will? Will we allow the evil one to convince us that we know enough about our Orthodox faith and there is no reason to learn more? The devil convincingly chats with us saying, ‘Why read about the saints? They are all the same anyway. Don’t go to Vespers it’s really not that important besides this is your only day to take a break! And certainly don’t bother to visit a weeping icon because it’s only a painting!’We must beware of our thoughts. We can’t allow ourselves to concentrate on any thoughts other than those of Christ, His most sweet Mother, and eternal life. Being judgmental, jealous, prideful, and especially content are all crowns of the evil one. Do not accept the devil’s whispers that there is always tomorrow! Before you try to analyze God’s works especially with a Miro bearing icon never forget that with God all things are possible. And with this truth don’t expect to completely understand God’s wonders either. Our minds simply can’t bear all that God has to offer us—at least not as we stand today! [Visit] St. Nicholas Orthodox Church Warren, Ohio.